I saw this recipe on Epicurious.com’s Facebook page last week and knew that I had to give it a try. There are some recipes that I wonder if I can pull off – this being one of them. Anything with a piping bag seems like a pain in my neck but surprisingly this was pretty simple. And, the rewards are big. You need a big crowd for this recipe. At least a hungry party of 6 to 8. The extra are now hidden in the freezer from me. Nothing beats good coffee ice cream, except good coffee ice cream in a profiterole with chocolate sauce. Chill a small metal baking pan in freezer. Form 18 ice cream balls with scoop and freeze in chilled pan at least 1 hour (this will make serving faster). Add eggs 1 at a time, beating well with an electric mixer after each addition. Heat sugar in a 2-quart heavy saucepan over medium heat, stirring with a fork to heat sugar evenly, until it starts to melt, then stop stirring and cook, swirling pan occasionally so sugar melts evenly, until it is dark amber. Remove from heat, then add cream and a pinch of salt (mixture will bubble and steam). Return to heat and cook, stirring, until caramel has dissolved. Remove from heat and add chocolate, whisking until melted, then whisk in vanilla and Cognac (if using). Keep warm, covered. 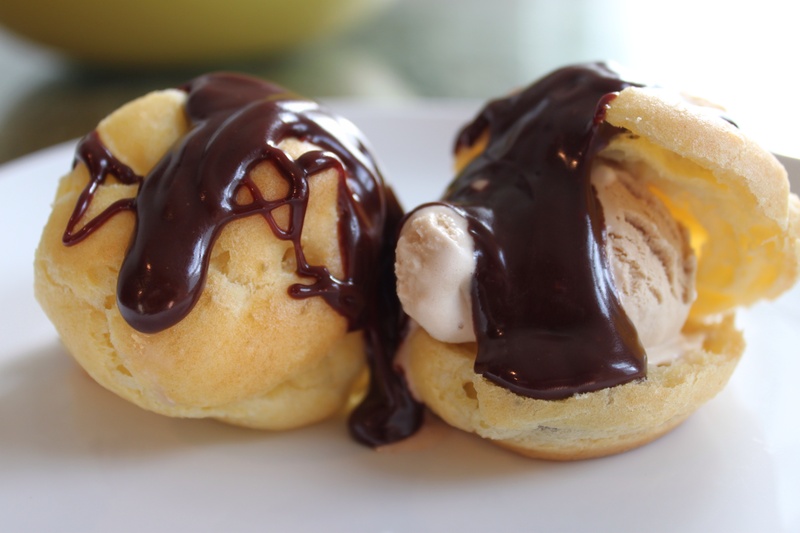 Halve profiteroles horizontally, then fill each with a ball of ice cream. Put 3 profiteroles on each plate and drizzle generously with warm chocolate sauce.